Owner Builder Network :: Testimonials : Jacobe and Deanna D.
"The choice was easy for us. Pay a builder thousands of dollars or pay OBN to help us save thousands. OBN taught us step by step how to build affordably, timely, and energy efficiently . A true 100 year home. Our family now lives in the dream home we could not afford with a builder. And upgrades- no tract home here! 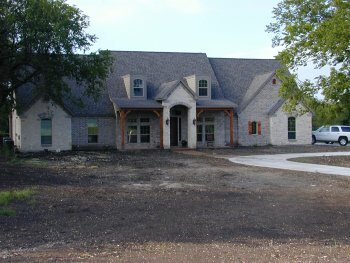 We have the hardwood floors, single and double Crown moldings, granite countertops, stone fireplace, cedar porch beams, slate and tile floors we have always dreamed of. And energy efficient too! For 2005 our all electric home of 3031 square feet living averaged electric bill was $224 per month. And one of the best parts is when friends visit and they ask who our builder was, we can look at them and say, "It was us!"